1190. Influx-Studio, Mario Caceres, Christian Canonico. For more information about this entry, contact the author. email: contact@influx-studio.com. 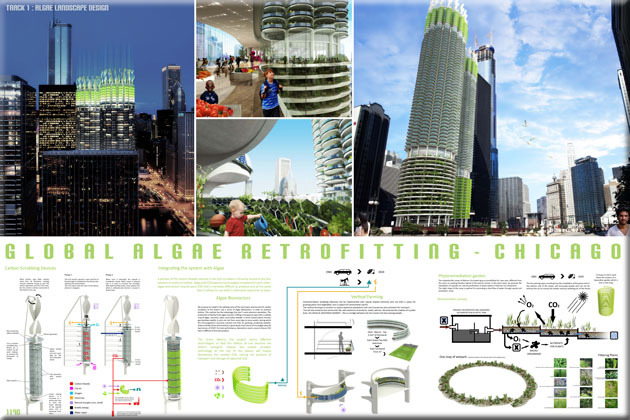 The Green Loop: Marina City Algae Retrofitting, Chicago. Entry 1190. By Influx-Studio, Mario Caceres, Christian Canonico. An algae based strategy for a new sustainable model in urban areas. Re-visioning an iconic building from the past century fossil fuel economy. An environmental vision committed with the Chicago Climate Action Plan. Growing algae, absorbing CO2, harvesting energy, filtering water, producing food. 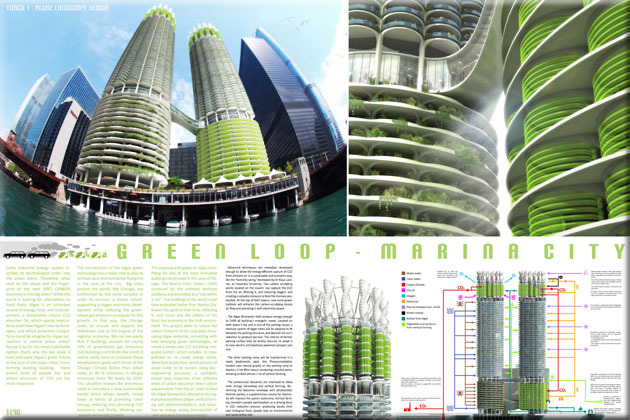 6:27 minute video of The Green Loop: Marina City Global Algae Retrofitting, Chicago (2012).